Why Rosacea Is Bugging You? One of the most difficult realities about rosacea is that no acne treatment works for everyone who has it. Some people just need to stop drinking hot cocoa and hot coffee, and like magic, they are cured. Some people get good results by taking special precautions to avoid sudden changes in temperature. Usually this means bundling up in cold weather, wearing face protection. And various medications and laser therapies work wonders—or don’t work at all. Demodex, a microscopic mite that lives in hair follicles and in skin pores, may be one of the causes of Rosacea. One of the more mysterious contributing causes of rosacea is a tiny mite known as Demodex. This microscopic creature is related to spiders and spider crabs, but it’s about 3/10 of a millimeter (1/100 of an inch) long and it looks something like a itty bitty slug that was run over by a steamroller. There are two primary species of Demodex that live on humans. There’s Demodex folliculorum, which lives in hair follicles, and there’s Demodex brevis, which lives in skin pores next to hair follicles. Both species are most common on the regions of skin where rosacea is most likely to breakout, across the brow and around the nose. For a long time, skin care scientists have known that some people who have rosacea have Demodex infestations in their skin and some people who have Demodex infestations in their skin have rosacea. What skin care scientists have had trouble figuring out is why some people who have rosacea have the little critters in the pores and some people who have rosacea don’t. Scientists at the Xi’an Jiaotong University College of Medicine in China may have come up with the answer. Most researchers have looked at the question of whether Demodex infestations cause rosacea or whether rosacea creates a home for Demodex infestations. It’s sort of like the old unanswerable question, “Which came first, the chicken or the egg?” The researchers at Xi’an Jiaotong University, however, took a different approach. They didn’t just look at rosacea patients. They examined over 500 patients they identified as having Demodex in their facial skin. They they looked at the associated skin complaints. The Chinese researchers found 860 people aged 12 to 84 being treated for some kind of skin problem. In this group, 539 had skin problems on their faces and 321 had skin problems elsewhere on their bodies. The researchers also studied people who had healthy skin, and they found that essentially 100% of the population has at least a few Demodex mites in their skin. Only newborns are completely free of the mites, and they acquire them almost as soon as they are picked up by their mothers and other family members. 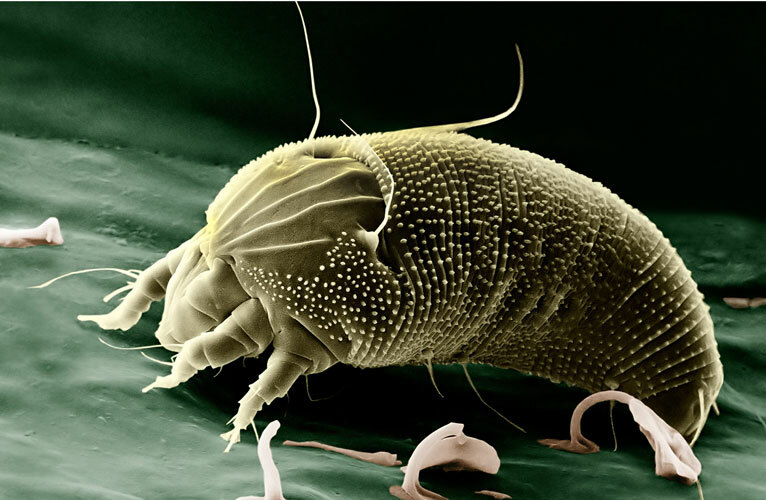 However, the research team found that having fewer than 5 mites per square centimeter of skin (30 mites per square inch of skin) was not associated with any risk of skin disease. Of the entire group, 43% were infected with high concentrations of Demodex mites, more than 5 mites per square centimeter. Whose skin was infested with high concentrations of Demodex? People over 30 were more likely to have high concentrations of Demodex than people under 30. High concentrations of Demodex grew on either dry or oily skin, but not on normal skin. People who had dry skin were 60% more likely to have high concentrations of Demodex than people who had normal skin. People who had oily skin were 140% more likely to have high concentrations of Demodex than people who had normal skin. And people who had combination skin (dry skin on the sides of the face but oily skin in the T-zone in the middle of the face) were 160% more likely to have high concentrations of Demodex than people who had normal skin. Rosacea was not the only skin condition associated with high concentrations of Demodex, although it was the skin condition most strongly associated with high concentrations of Demodex. People who had eczema were twice as likely to have high concentrations of Demodex in their skins as people who did not have eczema. People who had seborrhea were 2-1/2 times more likely to have high concentrations of Demodex as people who did not. And people who had rosacea were 8 times as likely to have high concentrations of Demodex as people who did not. Demodex don’t like to live on normal skin. They prefer dry skin, or, even better, oily skin. So could moisturizing dry skin and reducing the oiliness of oily skin reduce the risk of rosacea? The Chinese scientists think so, but they think that it’s more important to deal with oily skin issues than it is with dry skin issues. They note that rosacea usually begins when the oil glands in the skin fully mature, at about age 30, and tends to clear up on its own when the oil glands begin to stop making as much oil, at about age 60. They point out that the movement of the mites inside the pores of the skin irritates the skin, and the skin responds to irritation by producing still more oil. In some people who have rosacea, the combination of oil and Demodex infestation could trigger a vicious cycle that keeps the skin sensitive to the environmental triggers that cause rosacea, such as changes in temperature and exposure to noxious chemical fumes. This is all very nice, but what does it tell people who have rosacea? Here are some tips suggested by the Chinese research. Using oil-absorbent blotting papers every day may reduce the frequency and severity of rosacea flare-ups. It’s especially important to blot oil along the creases of skin that can harbor the most mites. It’s also important to avoid drying out the skin. Adding moisture to the skin is not the same as adding oil to your pores, even though the most appropriate moisturizers for people who have rosacea are based on oil in water. Use a light moisturizer that is free of alcohol and fragrances to keep skin from flaking—and feeding skin mites. Keep makeup to a minimum, or at least be sure to use the lightest makeup possible and be sure to cleanse it away every night. Opening your pores so they can expel excess oil deprives skin mites of their food.